Softens and detangles hair after shampooing. 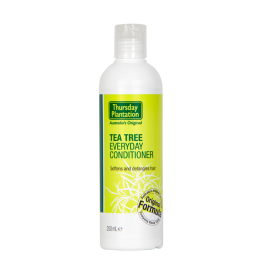 Thursday Plantation Tea Tree Everyday Conditioner nourishes and conditions hair and smoothes hair cuticles helping with detangling while maintaining shine. Gently massage conditioner through wet hair and leave for 1-2 minutes. Rinse thoroughly with water. For best results, use in conjunction with Thursday Plantation Everyday Tea Tree Shampoo.